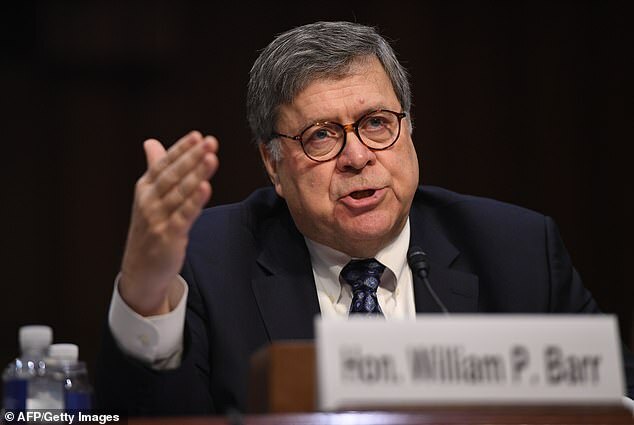 Barr made the statement as part of a hypothetical example during his first day of high-stakes testimony before the Senate Judiciary, asked about his views on executive power and whether the president could intervene in political cases. 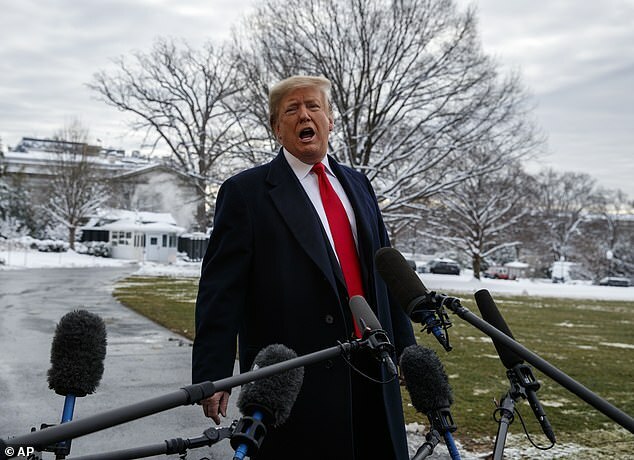 ‘The other category of cases –and let’s pick an easy bad example – would be if a member of the president’s family or a business associate or something was under investigation and he tries to intervene,’ Barr said. ‘He’s the chief law enforcement officer, and you could say well he has the power, but that would be a breach of his obligation under the Constitution to faithfully execute the laws,’ he continued. ‘So in my opinion, if a president attempts to intervene in a matter that he has a stake in to protect himself – that should first be looked at as a breach of his constitutional duties. Whether it also violates a statute depending on what statute comes into play and what all the facts are,’ he said. Such pronouncement would ordinarily be boilerplate, but takes on extra significance while a probe President Trump has labeled a ‘witch hunt’ continues to examine Trump associates and family members who had contacts with Russians during the campaign. Barr spoke as Senate Democrats pressed him on his views of the Mueller probe – including its investigation of any obstruction of justice by Trump, something Barr has criticized in writing. Trump fired FBI Director James Comey early in his term, and according to Comey asked if he could relieve pressure on his former national security advisor Mike Flynn. ‘I hope you can see your way clear to letting this go,’ Comey says Trump told him. As Demoratic Sen. Dianne Feinstein brought up in the hearing, Trump has called for rival Hillary Clinton to be jailed. His son, Donald Trump Jr., has testified to congressional investigators after a June 2016 Trump Tower meeting he attended with Russians. The Mueller probe has already resulted in guilty pleas by Flynn and longtime Trump lawyer Michael Cohen, and the conviction of former Trump campaign chair Paul Manafort. Barr was pressed on his expansive view of executive power at the top of the hearing. He called the president the nation’s chief law enforcement officer – but stated it wouldn’t accurately reflect his views to say the president could order a probe that would then be carried out of anything he wants. ‘Let’s say the president’s concerned about Chinese stealing trade secrets: I want you to go after this company that may be stealing trade secrets,’ he explained. ‘That’s perfectly appropriate for him to do – to communicate that. But, whether it’s bonafide or not, the Department of Justice’s obligation and the Attorney General’s obligation is not to take any action unless we reach … their own independent conclusion that it is justified under the law. Regardless of the instruction,’ Barr continued. ‘Everyone is saying I’m siccing – it’s okay for the president to direct things,’ he said. ‘All I said was, It’s not per se improper for the president to call on the Department for doing something, especially if he has no personal or political interest in it,’ he added. 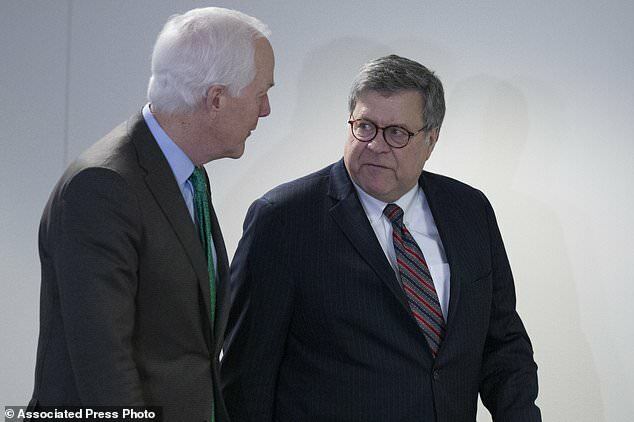 Senate Democrats opened the the Barr hearing to be attorney general by pressing him on his memo going after special counsel Robert Mueller’s probe and asked if he’ll have the ‘strength’ to push back at President Trump. Sen. Dianne Feinstein, the top Democrat on the panel, said in her opening statement she had read the memo that Barr sent unsolicited to the White House, and would press him on his far-reaching view of executive powers. ‘I believe it’s important that the next attorney general be able to strongly resist pressure, whether from the administration or Congress, to conduct investigations for political purposes,’ the California Democrat said. 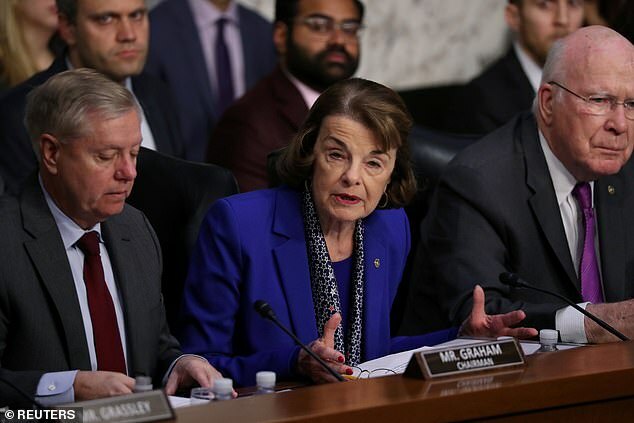 ‘He must have the integrity, the strength and the fortitude to tell the president no – regardless of the consequences,’ Feinstein said in her remarks. She said she would question Barr on his written argument that the president’s law enforcement powers ‘extend to all matters, including those in which he has a personal stake, and that the Constitution places no limits on the president’s authority to act on matters which concern him or his own conduct’ – and brought up Trump’s own vows to jail political opponent Hillary Clinton. ‘Let me just say that, some of your past statements on the role of attorney general and presidential power are concerning,’ she said. Right away, he provided an assurance he won’t allow Special Counsel Robert Mueller’s probe to be shut down. 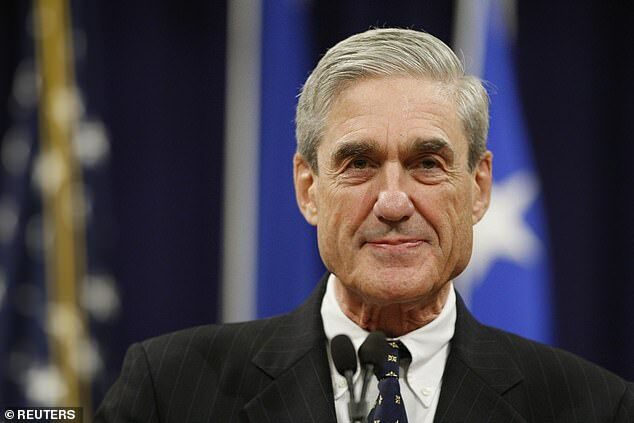 ‘On my watch, Bob will be allowed to finish his work,’ referring to his friend Mueller by his first name. He said Mueller wouldn’t be terminated except for good cause, that he wouldn’t hold up his resources. ‘I will serve in the same independence I did in 1991,’ he said, opening his remarks with quips about family members he brought along. ‘I feel like I’m in a position in life where I can do the right thing and not really care about the consequences,’ he said under questioning by Sen. John Coryn of Texas. Barr sprinkled his remarks with policy and rhetorical acknowledgements of the priorities of minority Democrats, even though Republicans in the Senate can confirm him without Democratic votes. Barr shared his view on Comey’s decision to announce why the FBI decided not to charge Hillary Clinton after investigating her emails during the 2016 campaign. In introductory remarks, Barr mentioned as priorities the right to vote, the integrity of elections, and foreign interference in elections. Barr introduced about 10 family members who are all government prosecutors or lawyers. New Judiciary Chairman ‘Lindsey Graham told the little boy he should be a doctor so someone in the family makes some real money. Barr’s financial disclosures revealed he has amassed about $37 million in assets. 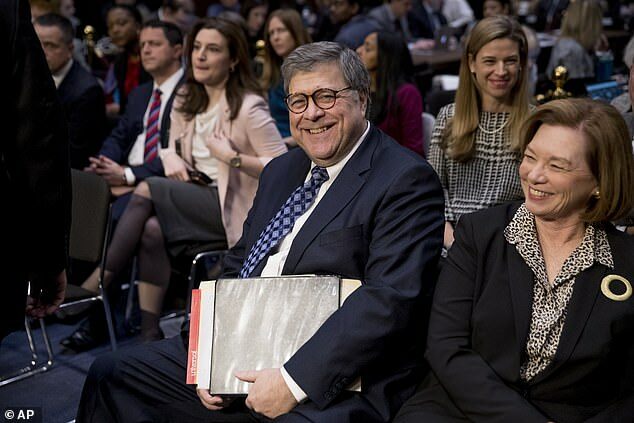 President Donald Trump’s attorney general nominee will have to navigate his confirmation hearing skillfully, emphasizing his support for Trump’s policies while assuring Democrats he will act independently and won’t interfere with the special counsel’s Russia investigation. Barr will face questions Tuesday from the Senate Judiciary Committee about his relationship with Trump and his views on executive powers. Barr plans to tell legislators that Trump never sought any promises, assurances or commitments – and that he didn’t offer Trump any – before he was nominated for the post. Trump has repeatedly complained that his first attorney general, Jeff Sessions, was insufficiently loyal because he recused himself from special counsel Robert Mueller’s investigation into potential ties between Russia and the 2016 Trump campaign. Trump ultimately forced Sessions from office. Barr, 68, is expected to be confirmed, unless there is a major surprise during the hearing. It would be his second stint as attorney general, a position he held from 1991 to 1993 during the George H.W. Bush administration. The hearing will be the first time a high-profile nominee will come before the committee since it considered the Supreme Court nomination of Brett Kavanaugh, who was accused of sexual misconduct. The panel has a new chairman, Republican Sen. Lindsey Graham of South Carolina. Graham said last week after meeting with Barr that the nominee has confidence in Mueller and will let him complete his Russia investigation. Barr and Mueller worked together when Barr was Bush’s attorney general between 1991 and 1993 and Mueller oversaw the department’s criminal division. The two men are ‘best friends,’ Graham said, and have known each other for 20 years. Their wives attend Bible study together, and Mueller attended the weddings of two of Barr’s daughters. On Monday, the Justice Department moved to pre-empt the most significant questions that Barr is likely to face by releasing his prepared remarks. Barr plans to tell the senators that it is ‘vitally important’ that Mueller be allowed to complete his investigation and that he believes Congress and the public should learn the results. ‘I believe it is in the best interest of everyone – the president, Congress, and, most importantly, the American people – that this matter be resolved by allowing the special counsel to complete his work,’ Barr says. Barr describes Mueller, a former Justice Department colleague, as a friend he has known personally and professionally for 30 years. Mueller headed the department’s criminal division when Barr served as attorney general. The special counsel is required to confidentially report his findings to the Justice Department. In his prepared remarks, Barr stops short of directly pledging to release Mueller’s report, but he expresses general support for disclosing the findings, whatever they may be. Democrats had raised concerns about Barr’s prior comments about the Russia investigation, including an unsolicited memo he sent to Deputy Attorney General Rod Rosenstein last year criticizing the inquiry into whether the president had obstructed justice. Barr also sent the memo to White House lawyers and discussed it with Trump’s personal attorneys and a lawyer who represents Trump’s son-in-law, Jared Kushner, he said in a letter to Graham. 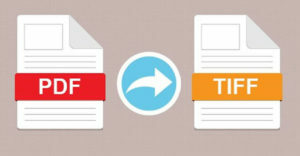 Copies were sent by Barr to White House lawyer Emmet Flood, Solicitor General Noel Francisco and Pat Cipollone, who is now White House counsel. Barr said he discussed the contents of the memo with Trump’s attorneys, Jay Sekulow and Jane and Martin Raskin. The development is likely to raise even more questions at the hearing about Barr’s contact with those close to Trump ahead of his nomination. He has insisted that the memo was not to influence public opinion about Mueller’s investigation. Barr’s role leading the Russia investigation may be especially important since Rosenstein, who has overseen the day-to-day work of Mueller’s team, expects to leave the Justice Department soon after Barr is confirmed. It is not clear how much of the investigation will be left by then. Barr would replace acting Attorney General Matthew Whitaker, who declined to recuse himself from the investigation – despite the advice of a Justice Department ethics official and calls from Democrats who cited Whitaker’s past critical comments on the probe.